As with all good wine shops, my two favourite ones send out weekly emails with their new arrivals and best values. I always peruse thru the latest options, but I’m more of a tactile person, so I prefer to browse bottles in the store rather than online. 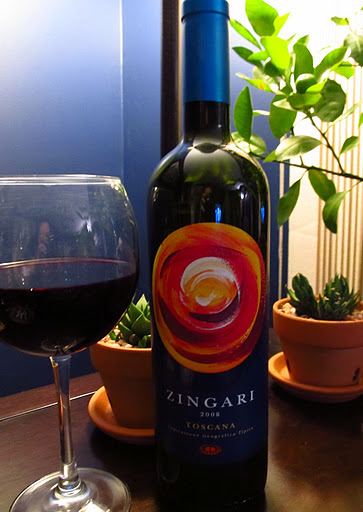 This week both the label and the description of the Petra Zingari Toscana 2008 in the email caught my eye, so I made sure to pick it up. Deep garnet in colour, cherry and floral aromas drifted about in the glass. Flavorsome blackberry and raisin elements were framed by oaky notes in the medium body. Although fruity, it was not sweet, and the chipotle sweet potato soup I was enjoying placed a spotlight on the pleasant dryness. Tart cherry flavors kicked off the finish, while toast and a cozy, woodsy nature contributed depth and length. Each glass became a little mellower, a little more smooth. A good everyday wine, I was reminded of a homey Italian restaurant in Little Italy where unlabeled, pour-your-own carafes are found at every table.